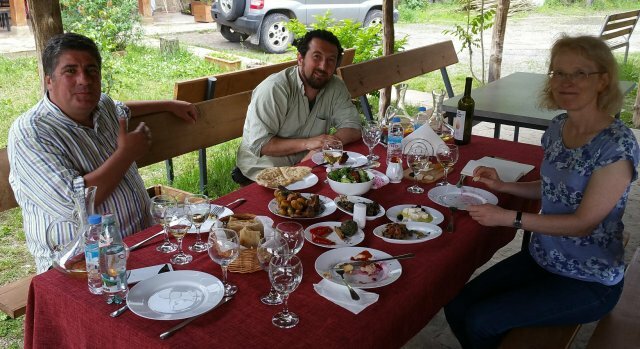 My first visit to Georgia was mainly in Kakheti – the Eastern part of Georgia, where most of its wine is made. It made a big impression on me, and since then I have spent a lot of time reading, thinking and writing about Georgia. 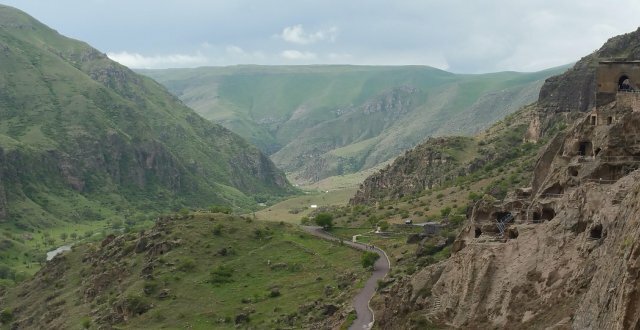 I had to return, and this time headed South and West from Tbilisi, spending one night near Vardzia and three in Kutaisi. The remaining three nights, immediately after and before our flights, were in Tbilisi. This time there was just the two of us in a car with a guide, on a private tour organised by Living Roots, which was a very much more intimate experience compared to the Arblaster and Clarke trip last time, and considerably cheaper. The number of wines we got to try was a considerably less, and we generally drank the wine, as God intended, rather than tasting it. But that was no bad thing. In addition to natural qvevri wines bottled for sale, we drank undocumented homemade restaurant house wines probably made the same way, and a couple of examples of cheap factory wines (as the Georgians sneeringly call them). Just to be clear from a disclosure point of view for anything I might write about this trip – I believe that we paid through Living Roots for everything we received. It was a holiday; not a press trip. In the South we visited the cave-city of Vardzia. Established in the 12th century as a place to hide from invading armies, it grew to a man-made cave complex on 13 levels suitable for permanent inhabitation. A series of earthquakes later exposed the cave-city in section, which is what we see now. Further North, and much close to Kutaisi, we visited the Gelati Monastery. 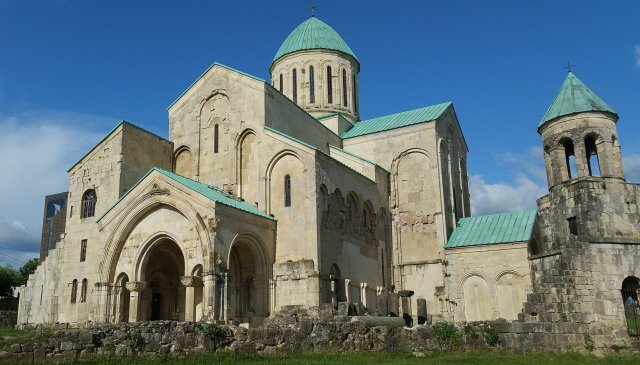 It was founded in 1106, and became one of the most important cultural and intellectual centres in Georgia. Travelling North-West from Kutaisi, in the Samegrelo region of Georgia, we saw the beautiful Martvili Canyon, and rafted in a more gently flowing part of the river, also visiting the large limestone Prometheus Cave on our return journey. The wine producers we visited were: Archil Guniava Wine Cellar, Nikoladzeebis Marani, Oda and Vino Martville, Nika Vacheishvili’s Marani, and Gotsa Family Wines. I’ll try to write more about them in later posts, but right now I would just like to say what wonderful lunches we had in those places. Our visit to Archil was late in the afternoon, and even there we were offered delicious khachapuri, tomato, cucumber and nuts. Apart from lunches at winemakers, there were a few other foodie highlights. On our first evening we had great food and wine at g.Vino in Tbilisi. Here, there was a good selection of natural qvevri wine, and the staff were very friendly, helpful and knowledgeable. For lunch the next day we were in Poka Nunnery, in a cosy dining room with a wood stove. The whole meal was good, but I particularly remember the river trout, boned, and stuffed with onion, and the selection of hand-made nunnery cheeses to finish. Another meal that stood out was a dinner in the Kutaisi restaurant Sapere. The delicate spicing of the food was wonderful, and I also remember we drank a particularly good bottle of wine. The final meal of the trip was back in Tbilisi at the restaurant Barbarestan, which was significantly more up-market than any other place we visited in Georgia. 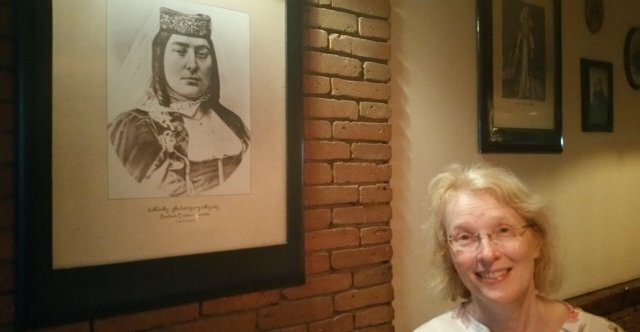 All the recipes were taken from a 19th century cookbook written by Barbare Jorjadze, so every dish is traditionally Georgian, but not necessarily commonly eaten in modern Georgia. The decor and crockery is also perhaps how you might imagine things to have been back in 19th century Georgia. The food was good, and interesting, but I think the extra Lari we spend to eat in a place like this mainly went towards providing a very polished level of service. It was fun to try, but personally I prefer a more laid-back atmosphere. This entry was posted in General and tagged georgia, natural, qvevri, restaurant, travel. Bookmark the permalink.